Ad 2 captures your attention with the phrase that has been a tag on all of our ads for a very long time. This time it is the only content in the ad outside of the header and footer. 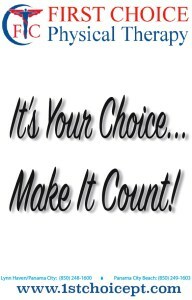 What does “It’s Your Choice – Make It Count” mean? When you see it close to our logo you probably already know that it means two things. One is that it is up to you whether you go to your family doctor first or First Choice Physical Therapy or another physical therapy office. You do not have to have a referral from your doctor to see a physical therapist. The initial evaluation after you have had an injury can be by a Doctor of Physical Therapy. If you have an injury that warrants visiting a medical doctor, we will be sure to direct you that way. The second thing it means is that if your doctor is requesting that you get physical therapy, you have the right to choose where you go for that therapy. Be sure to tell your doctor that you want to come to First Choice Physical Therapy!